Wedding / Event Insurance helps cover the costs of mishaps, damages, and injuries that could occur during your event- whether by a guest or vendor. Nowadays most venues, for example, will require some level of insurance. So, while it’s an expense that flies under the radar most of the time-it affords you the peace of mind should unforeseen circumstances arise. Taxes and service fees can sneak up on you as you start to book your wedding services. Sales tax varies by county and in the greater Orlando area, you can expect sales taxes to be between 6% and 7%. Service fees are the cost of executing a specific service, and are not the same as a Tip (general guideline for tipping is 20%-30%). Different vendors have different fees for…you guessed it… different services, so be sure to read your contracts carefully! *Bonus tip: Don’t forget to purchase your marriage license! When you’re having the time of your life, you know what they say: “Time flies!” Consider allocating some funds in case you want to extend your event time- that means extra event hours with your venue, and talking with your vendors to make sure it’s possible with their schedule as well! Also, despite your best efforts to have everyone out and everything cleaned on time, sometimes you need a little more time. Communicate with your venue and vendor team ahead of time, to discuss over time fees so that there are no surprises! No doubt you’ll want to look and feel your best on your big day! Leave room in your budget to pamper yourself with a massage, facial, etc. When it comes to your beauty items, consider splurging on your favorite perfume so that the scent always brings you back to your special day. These are just a few recommendations! 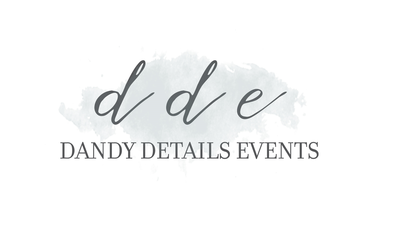 Dandy Details Events is a Central Florida and National Wedding and Event Company.